Can I trade in my financed car for a new one? Yes, you can. Dealerships do this every day because your former lender still gets their full amount on time. Let’s look at what this process involves and whether you should do it or just retain your current financing plan. 1. Should I trade in a car that’s not paid off? 1. Is the loan canceled with the trade in? Let’s look at some favorable situations. When a buyer has positive equity, it means that his car exceeds the loan in value. For instance, you bought a car worth $40,000 and received credit financing worth $30,000. What happens when the car depreciates by 20% and you pay $10,000 after one year? The car’s new value amounts to $32,000 while the outstanding balance drops to $20,000. So, your car’s value exceeds the credit by $12,000. You won’t have to top up any balance when buying a car from a different dealership. If your credit score was 689 when you got the original loan but you improve to 720, you can apply for a trade in. Why is this a good move? Because the interest rate on auto financing drops by 50%. Let’s assume you joined a credit union the same time you got your current auto loan. After two years, the union decides to offer you an auto loan at a more affordable interest rate compared to your current lender. This announcement also coincides with your plans of getting a better car. Is trading in a wise decision? Yes, it is because it saves you money. If the bank financed you at 5% and your credit union is willing to charge you just 2.5%, ditching your bank is the best financial move. Paying high-interest rates only makes credit lenders rich. Let’s assume you’ve just landed a nice break in your business. Now, you’re guaranteed of making thrice the profits you previously made thanks to getting new clients. The obvious boost in your financial situation is so huge that can you can get out of a negative equity car loan with just one payment. Should you go ahead and trade in the car? Yes, you should because you cannot recoup the high interest incurred through a private sale. Trading in enables you to make the best out of a bad situation by bridging the gap between credit and your car’s value. If you’ve just received a major job promotion and want to reward yourself with a new car, you can ditch your used one by doing a trade-in. Used cars might be affordable but one has to spend extra money replacing old or damaged parts. Trading in enables you to get a better quality car because dealerships allow you to pick new cars. You just have to meet the laid out requirements for the new financing arrangement. Plus, buying a new car has a greater sense of achievement than settling for a used one. Trade-ins make upgrading to the latest vehicles easier because you need less cash for down payment. If you’ve just got a new baby and need a larger family van, this purchasing option ensures that your family enjoys the best safety features in private transport. This method is ideal for motorists loyal to particular brands. If your favorite brand is Mercedes and you own a previous SUV model, you can easily upgrade to the latest edition by doing a trade-in. Doing this gets you value for money because you get a good offer for what’s most likely your dream car. 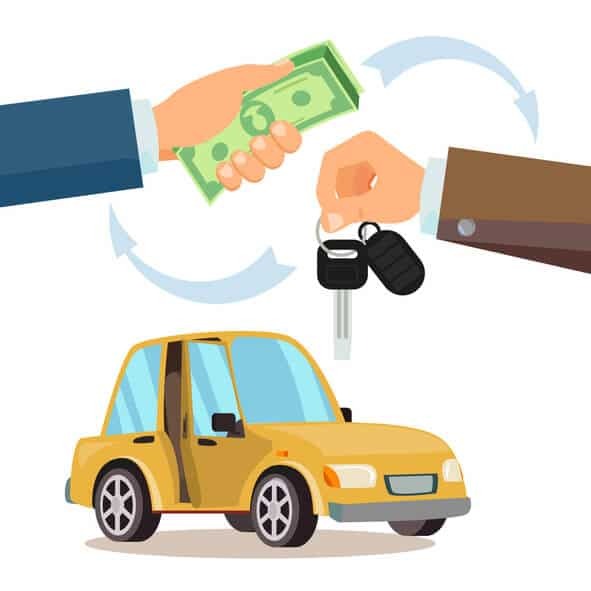 What is auto credit history? It’s a record that shows your performance with previous and current car loans. In order to increase your credit limit when it comes to auto finance, you need a rich history. In order to buy a luxury model, credit lenders focus on debtors who have at least three fully paid loans in their auto credit history. Trading in your car is a direct step towards building sufficient credit history. Your current dealership pays your outstanding balance in full. This doesn’t nullify your previous monthly payments. Tip: Do Blank Check Auto Loans Really Work? What happens when the new lender repays your outstanding balance? Your credit score on the previous loan improves and so does your overall ratings. This purchasing method ensures that your lender receives all due payments within your agreed repayment plan. Earlier on, we saw that applying for a trade in boosts your auto credit history. In order to get the best interest rates for future car deals, you need an excellent credit score. Doing a trade in enables you to gain this improvement as well as an upgrade to a better car. No, it’s not. Your new lender rolls it over to your current repayment plan for the new car. This is manageable when a debtor owes less than $10,000 on their current auto loan. If your debt exceeds this amount, applying for a trade in might be unwise. Why is this a bad move? Because the car payments get so high that you might experience struggles keeping up every month. Plus, there are comprehensive insurance payments, which tend to get expensive. Buying a car using this option is unsafe because there’s a high risk of making late payments. Sometimes, buyers who opt for this method end up with damaged credit scores due to hitches in clearance. After your new dealership pays your outstanding balance, they receive the title of the car you want to trade in. On the other hand, they may not follow up with credit reference bureaus. If the previous creditor didn’t close your credit account, the digital payment system considers you a defaulter. Each skipped payment date appears in credit reference bureaus and lowers your credit score. This type of trade in is limited to buyers with good credit ratings. Creditors feel wary dealing with high-risk borrowers and so they feel hesitant repaying outstanding balances on bad credit auto loans. If a debtor happens to lose their jobs and can’t afford the car, two things might happen. He or she might decide for a voluntary surrender and bear the consequences. Alternatively, one can post an advert and wait for a private buyer. However, this option has slim chances of success due to the outstanding balance involved. Apart from affecting your credit score, defaulting represents you badly in the eyes of potential auto finance lenders. It makes it hard to obtain financing beyond your previous limit and this confines your choice of cars. Auto finance lenders expect you to present your credit report when applying for a trade in. Make sure you download it a couple of weeks in advance so that you can find out whether your previous lender updated your credit account. It’s wrong to assume that your lender’s credit statement is accurate. Download your bank statements to confirm whether the deductions in your account appear in the lender’s records. Doing this helps you to know exactly how much you owe so that you can provide correct information in your trade-in application. As a rational debtor, your priority is getting credit at the lowest interest rate possible. Take time to evaluate what every lender has to offer by visiting several offices. When you approach a dealership for a trade-in, the sales rep will undervalue your car. They do this to sign you up for a high loan principal. It enables them to get larger sales commissions and the dealership makes more interest. You can rely on Kellys Blue Book to give you an accurate estimation of your car. This purchasing method makes sense when you have positive equity and planning to get a better car. It’s also a great way of getting out of an expensive auto loan without damaging your credit score. Boosting your auto credit history enables you to get better cars for your personal or family needs.